What better way to learn about the science and technology of mechanical movement than to make an automaton. They have a very long history. Since ancient times, various civilisations and cultures have produced what can be called automata, a term that can be applied to machines that imitate the actions of living creatures, and machines with a pre-determined set of actions that repeat themselves cyclically. Using automata as vehicles to study science and mechanics has a historical resonance. While in general automata were created for entertainment and ritual, they were also an important channel for scientific and technological discovery, especially in 18th and 19th century Europe. Known as the Golden Age of automata, top European automata-makers such as Jacques de Vaucanson and the Jaquet-Droz family, were at the cutting edge of technological progress, producing highly sophisticated and complex machines. They were not just inventors and innovators, but also showmen and performers: this was the age when science and invention, magic and theatre were of the same world. At sell-out performances, their incredible machines astounded the public with their ability to represent the functions of humans and animals, fuelling bitter religious arguments about the extent to which humans themselves were merely machines. Famous examples of such automata include The Duck (de Vaucanson), a beautiful creation finished with a metal body, which convincingly ate, defecated, drank and swam. Another was The Writer (Jaquet-Droz), a figure sitting at a desk which could write using an ink pen, and be programmed to write anything up to 40 letters long. Automata were used to research how the human body works. Creating human-like machines meant studying the human body, and self-referentially the machine became a proxy to research how the body functions. 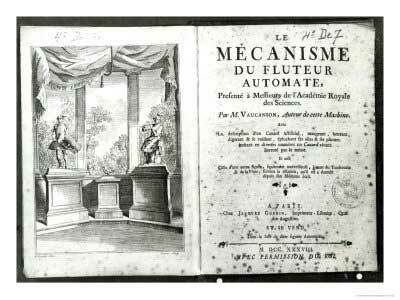 De Vaucanson’s The Flute Player, an automaton with a lung that plays the instrument like a human, was as much about figuring out how humans play the instrument as creating a masterpiece of lifelike automata. The fascination of automata lies in the congruence of science and art, performance and engineering. In the 18th and 19th centuries science evolved within a tradition of spectacle, as embodied in the Golden Age of automata, before splintering off into a specialised discipline. Today’s automata or mechanical toy workshops continue that tradition of inspired invention, of ingenuity, of art and technology, and of being a creative playground to learn about science and technology. The colourful, quirky, funny little machines that can be made in even a short workshop have a long ancestry.